This delicious granola bar recipe is easy to make and required no baking at all! Just mix the ingredients together, press into a pan and you're on your way to a delicious snack. Made with rolled oats, peanut butter and ground flaxseeds, these granola bars are much healthier than many store bought brands and you can customize them to suit your taste preferences. If you don't like dried cranberries, try adding raisins instead. Maybe skip the chocolate chips and go for some toasted coconut-it's up to you! Whatever you choose to add, these bars will be great! In a medium sized bowl, mix the oats, ground flaxseed, cranberries, pecans, chocolate chips and salt. In a separate small bowl, whisk together the peanut butter, honey and vanilla extract. Combine the oat mixture with the peanut butter mix and stir, completely mixing all the ingredients. Transfer the granola bar mix into a loaf pan or square baking pan that is lined with foil. Remove the granola bars from the fridge and use the foil to lift the bars out of the pan. Cut into your desired shape and enjoy! 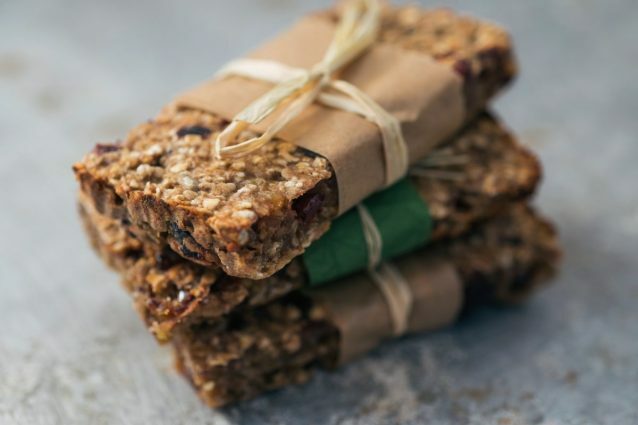 -After you cut the granola bars, wrap them individually in waxed paper for a super easy grab and go snack later on. -Keep the base recipe the same but change the additions. Try using almonds instead of pecans, m&m's instead of chocolate chips or just about any dried fruit in place of the cranberries. Blended banana cake: just blend all the ingredients together!